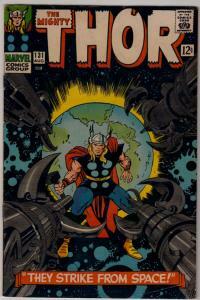 Up for auction is a copy of The Mighty Thor #131 in Very Good+/Fine in condition (check out the scans). These books are a great way to fill out or start your collection! The pages are off white to white, supple and clean. From the scans you can see the page color of each book as well as the curl that each cover opens with, strong clean staples and spines! The book you see is the book you will get, bagged and boarded (i hate getting books not bagged and boarded). Shipping is $3.50 for this book and i combine shipping to save you money so please look around for other items. I do ship overseas, cost is dependent on where you live, please figure on 10 ounces for shipping unless you buy more than 2 books. I will ship within 3 days of purchase and ask that you pay within 2 days of winning the book unless you are bidding on other auctions i have up. Please email within 3 days with intent to return. Buyer pays return shipping and original shipping is not refundable.